Everything is going aero in 2015, from frames to bottle cages. We have seen from bikes like the Venge and Madone that the front end of the bike has the most effort put in to reduce drag, making the handlebars an obvious place to start. The Bontrager Race Lite Aero Handlebars are one of the cheapest aero road bars that money can buy, coming in at £69.99, making them an attractive option for a DIY aero bike (Graeme Obree would certainly be a fan). In terms of shape, the bars have a flattened top and a clamping area wider than many other aero bars on the market. I particularly like this as it allows for either clip on TT bars or out front computer mounts and even a front light. A light may disturb the aerodynamics, but if I am caught in the dark I would rather lose 23 seconds per hour, rather than being invisible to a car from not being able to clip on a light. I also found it easy and secure enough on the flattened aero section to hold the bars there when climbing or just cruising. It is one of the major benefits of the 6066-T6 alloy aluminium used, which is very sturdy. This is partly due to the material, but also helped by the increased clamping area, which is the foundation for a sturdy bar. It does not have any real feeling of flex when pulling hard, but despite this I did not feel too much road buzz through them. It makes them very comfortable to use. Assisting this comfort is the slight flare in the drops, which allows for extra stability when sprinting or descending. It is certainly not massively pronounced when you look at them, but you can certainly feel it when riding in the drops. Aside from this slight flare, they are a regular compact bar, with a 123mm drop and 93mm reach. The most important element of any aero bar is the aerodynamics. Bontrager claim that they will save you "23 seconds per hour compared to traditional round bars". This is a slightly vague claim and unfortunately not one that we can verify given that budget approval for the road.cc wind tunnel is has not yet been forthcoming. However, they feel quicker and given the stability from the flare, certainly makes it feel like you can go faster whilst still staying in maximum control. 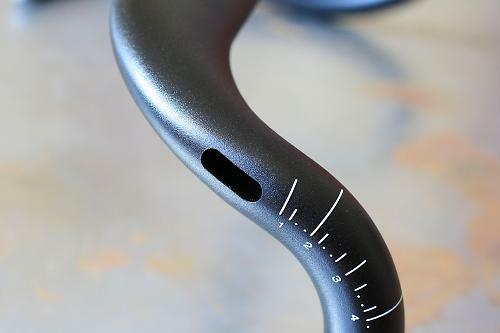 As well as an aero shape, hiding cables also has an important part to play and internal cable routing is included in these bars, with holes on either side next to the shifters and a single hole behind the clamping area. Fitting internal cables is a challenge at the best of times and these are no exception, in fact I found these slightly more difficult than others I have fitted in the past. The holes are fiddly, which took me a long time to fit, but once through the rest of the installation was easy. Coming in at 345g (claimed weight is 340g) makes them fairly heavy for handlebars of this price, but as with all things aero, the weight is secondary to the aerodynamic function. In terms of price, the RRP is £69.99, which is remarkably cheap for aero bars, even if they are made from aluminium. Overall, I was impressed with these handlebars, offering a decent level of aerodynamics but with the practicalities that the extra clamp area presents. I found them stable, yet without the excess feedback that you often get with stiff bars and a fair price coming in at £69.99. Perhaps I would like to see better internal cable routing as the initial setup is fairly fiddly and the weight could be lower, but all in, I enjoyed using these bars. These are big claims and especially when it comes to the more technical aspects, such as the 23 seconds per hour, not something that I can really test. However, I certainly found them to be comfortable and a strong performing bar. Once they are on, they work very well, providing a comfortable ride but without having too much flex when really pulling hard. The only aspect that has marked them down is the holes through which the cables are routed, which could do with being a little easier to use. I can't make any specific claims regarding the aerodynamic features, given that I have no access to a wind tunnel, but they are good looking, comfortable and stiff bars that I enjoyed using. 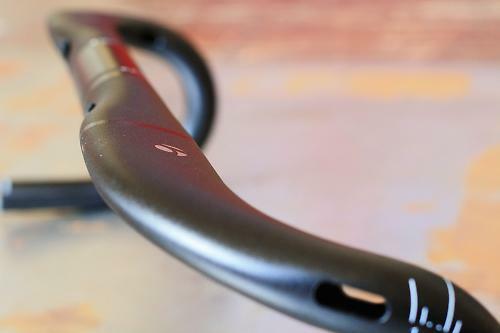 Where most aero handlebars are carbon to cut down on the weight, the fact that these are made from 6066-T6 alloy means that you'll worry far less about hidden damage. If I were to take a big fall on these, I would be happy using them for the rest of the ride, rather than worrying about them snapping in half. 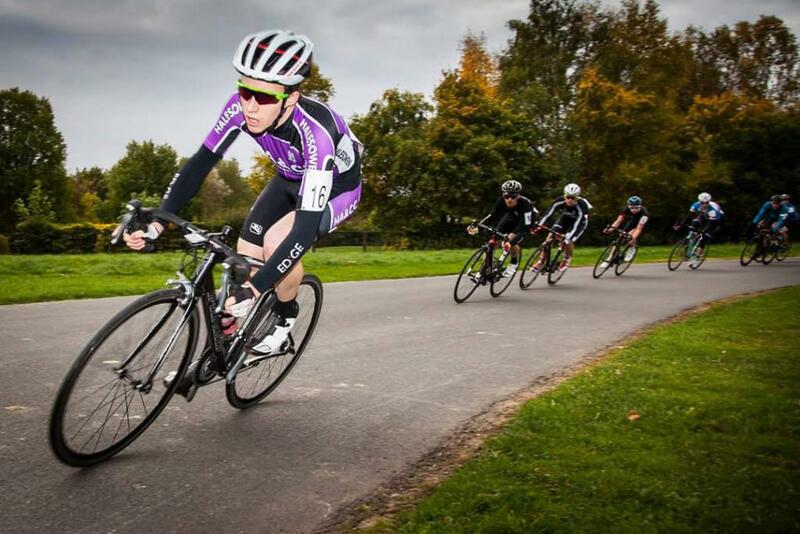 Like most aero features, you sacrifice on the weight to gain on aerodynamics. At 345g, these are no exception. The slight flare on the bars, combined with a compact design creates a comfortable ride. The bars are also stiff enough that there is no flex when pulling hard, but do not allow too much buzz through the bars as a result, meaning that you don't get shaken to death on uneven surfaces. With an RRP of £69.99, they are no cheap as far as handlebars go, but are the cheapest aero handlebars that are readily available, making them a good deal. The bars worked well, the aerodynamics certainly felt like they were performing well, but without a wind tunnel it is always difficult to work out exactly how effective they are. Away from this though, I found them comfortable to use and sturdy in the hands, without giving too much feedback from the road. I really liked the slight flare and also the general look of the bars. It meant that not only was it comfortable to use, but that they also looked really good on my bike. The holes at the rear of the bars for the internal routing could have done with being a bit larger. It was difficult to feed the wires through compared to others I have used in the past. Really good bars coming in a strong price for the aero market. For anybody who is looking to go more aero, but without breaking the bank on handlebars, these should certainly be on your list. 23sec/hr? You're being taken for a ride! To achieve that - close to 1% - you'd have to cut the drag of the entire bike and rider by close to 2% (drag rises by the square of speed). But the bike is at best about a fifth of total drag, so to get that kind of speed benefit from a bike modification alone means taking 10% off the drag of the bike. If you really believe that changing handlebars reduces the drag of your bike by 10%, then by all means send £70 to Bontrager. Or, better, send me £50 and I'll send you an "I'm Faster" certificate signed by my cat, who I'm told is a world-famous aerodynamics expert. 23sec in 1 hour would be closer to 0.75% no? 23 seconds doesn't seem a huge amount over the distance you can cover in an hour. And seems backed up by similar claims by other manufacturers, as well as "real world" tests by websites and magazines (one in the current issue of Cyclist that I read last night for example). I have these bars - really just to try whether a flatter top section was more comfortable for me rather than for any kind of aero gains. I like them. I just tried using the internal routing with new Sram shifters - I found it really really hard to fit the cables without scuffing them whilst going through in and out and once I had fitted them the routing into the shifters for the gear cables was too kinked to allow for proper shifting. Maybe OK for Shimano, perhaps easier with your shifters further down the bars but for me it just didn't work. Yeah, of course they do! One frustration with the aero bars is the lack of real estate left & right of the stem for a GPS mount (I know you can buy a 3D printed mount, but I don't want to). Is there a reasonable allowance for a GPS mount? Honestly try one, they're like £7 off ebay and are so much better, I will have one on every bike I build. I sell Bontrager stuff and generally like it......but when it's near impossible to set up mechanical shifting on any Trek with a slammed stem without monstrous shifting friction (and even damaged housing from trying to fit it in there) I belive these bars should carry a "electronic only" label. Also smacked my wrists when sprinting. both the mechanic and rider agree, Bontrager Race VR-SF over RL aero any. single. day.